What are the Most Important Items to Pack in Your Hospital Bag for Labor and Delivery? I've looked at a lot of lists telling expectant parents what to bring to the hospital for labor and delivery. Those lists have had some bizarre items on them, and you may find that a lot of those items are already provided by the hospital! I'm a chronic over-packer, and I ended up in the hospital for 5 days when I had my first baby. Even with everything I brought, I didn't need half of it. When it was time to leave, my husband and I were insanely concerned over our new baby's comfort and happiness, as well as overloaded by our own nerves about going home as a family. We also had to take home the lovely flowers and gifts we had received during our stay. Needless to say, all of those items I had decided to pack became a huge burden! You'll definitely want to have certain items with you as you labor and delivery your baby. , but it's important to only take what you need! 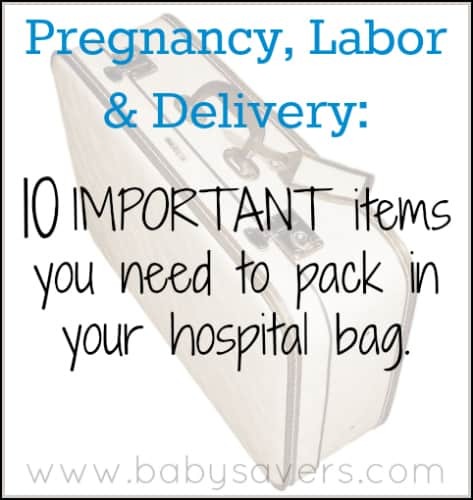 Like I said when I shared the items and products the hospital provided for labor, delivery and postnatal care, it's a great idea to ask what's provided before packing up a huge bag with items the hospital won't let your use. You also might be surprised at how little you'll need to bring along for new baby! I also understand that this isn't a comprehensive list. It's only the essentials. I just want to encourage you to take those other What to Pack for the Hospital lists with a grain of salt and remember that everything you pack has to be loaded up and brought home! Readers: What items were essential for you during labor, delivery and postnatal care? I agree, don’t pack too much! It’s just a hassle. If you have an uncomplicated birth the hospital stay will feel like a blur. I haven’t had a more complicated birth, but even if you were in for a while I would think caring for the baby and sleeping still takes up most of your time. I would add a couple things to the list of essentials though. It’s not to say you might not want or even need things beyond what you brought, but if the need arises you can always get it! Send your partner or friend/family member to your house to pick up your nursing pillow if you find you want it. Get someone to bring you a snack if you find you’re craving something specific. See if the nurses have any old magazines lying around if you feel like you need a little light reading to calm your mind. But bring less initially and you’ll only have to carry home the stuff you genuinely needed.